The following is an invitation from Mitchell Self, head of Ye Olde Gorilla Studios, a new interactive game and media studio. 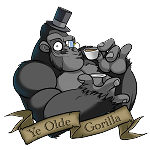 We are a new Interactive media/game studio called Ye Olde Gorilla Studios. If you've ever heard the phrase "Infant Phase", we would be in the "fetus stage" to put things bluntly. For any great ideas to come to light, we need the right team. Having said that, we're looking for help. We need Your help. We are looking for people that have drive, desire and passion for games. We're developing a game that is based directly on the Swat Kat series. More details will come if you're interested! This is a early animatic test of a game we are currently working on in conjunction with Tremblay Bros studios Swat Kats Revolutions. Artwork is by Ross Schnider. Voice work is by TJ Anthony, Heather Anthony, Popi. Script writing, editing: Mitch Self. We helped the Tremblay Bros. during their initial SWAT Kats Revolution Kickstarter Campaign promotion efforts. When do we start working on the project? Immediately, however we will have to adjust for other things happening to one another as we are not a full studio that lets us do this full time. We each have work outside the project and work on it when we are able. What teams or groups will be assembled to work on this project? We are in the process of assembling a small team together that can produce a proof of concept to pitch to Warner Brothers in hopes to gain primarily a contract or at the very least, a license agreement. If we live in different states or countries, will we be allowed to work remotely? Do you have a timetable of when the game will be released? No. While we would love to state that it will be ready in two years, we are still learning the trade ourselves. Will we have discussions with the Tremblay brothers on the project, as well as the workflow of the project? We have discussions with the Tremblays with what we’re trying to accomplish, what our ideas are in a general sense and get their opinions as to how our work flow is moving and story line is growing. They are guiding us as they have told us before that we remind them of how they started out and want us to succeed. Are new ideas welcome to the table when we discuss the game? Absolutely! I want to cultivate new ideas to the best of our abilities. A great idea can come from anywhere! I want to know where you see this project and studio going within the next five years, what your current major goal is and how you plan on reaching it. We see this project being our spear point into the industry as not just a separate studio of creation, but as people who are able to take an idea and mold it into something as tangible as a video game. Within the next five years, we hope to see our labors bear fruit as well as have the potential of acquiring new ideas and licenses to create new content and work with other great industry leaders on said ideas. Is this a for profit project or a "for fun" not-for-profit project? Will participants need to sign any legal documents concerning NDAs (non-discolsure agreements)? Yes, we now have an NDA to sign before we can bring you into the server/project to protect key elements. While were confident many wont be able to run off and make a Swat Kats based game with our idea without getting approval from The Tremblays or Warner Bros, we want to protect our, and hopefully your ideas too, that will add to our project. Are there any legal hurdles to overcome as WB owns the merchandising rights to SWAT Kats (which includes video game rights)? The Tremblay bros are helping us by allowing us to meet with WB to work out a deal for the interactive media rights for the game. Our goal is to get a contract through WB to work on the game and allow us to work full time on the project and also allow us to fully launch into a full scale production studio. Do you have any examples of past work to showcase? We are brand new at this and while I myself have a bit of experience in the field itself, the rest of the small team are using this as a way to get our feet wet in the Development field. Do you have a website with additional information about your studio including contact details, etc.? As of right now, no we do not. We are working on getting more info about us put together but we need the help via graphic designers and the like. How long have you known the Tremblays/what's your relationship with them? We have known the Tremblays since 2014. we are working in colaboration with them to adhere to the spirit and style of the Swat Kats franchise for our game and story. We approached them in 2014 with our idea and they have been working with us to guide us and teach us what we need to do to develop a functional game/series. They have been our mentors, guides, teachers, friends and our insiders to help us reach the right people we wouldn't have ever contacted if not for them. Interested? Fill out the form below to take the first steps toward joining this project. If you aren't able to help, that's super okay, but if you could please pass the word on as word of mouth helps just as much as any newspaper.